I really do save everything. Including old envelopes and packaging materials from everything that comes in the mail (this pile of stuff can get unwieldy since I tend to buy online quite regularly with packages coming in the mail all the time!). So I made myself a new address book and two other blank books, all with materials from the mail. The other two books tha I made are both exposed spine chain stitch bindings. 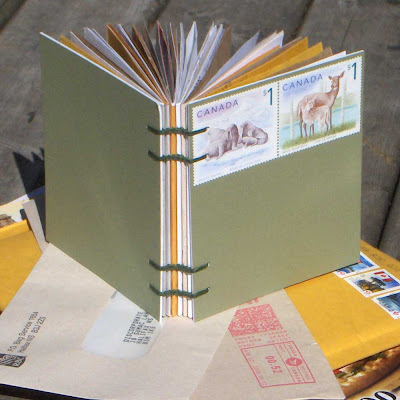 The covers are mat board scraps with some used stamps mounted on them. 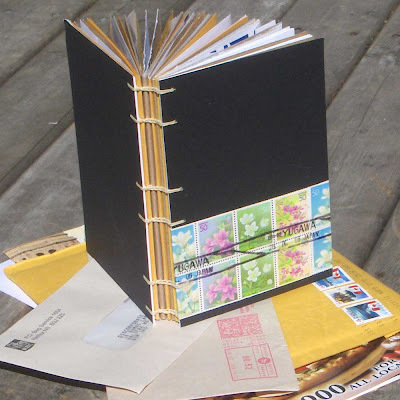 Similar to the address book, the pages are all cut from envelopes and packing papers. These two books are in my Etsy shop. So entertaining -- where are the stamps on the lowest book from? I just made my mother an address book, but hadn't thought to make it thematic. So intrigued! Brilliant! Love the use of the recycled items. thanks dangandblast, sue, and ali! dangandblast, the stamps on the black book are Japanese. Very pretty aren't they? ali, yes I am not surprised that you like these books! and since i started wokring on these, i've been carefully watching the mail to make sure no interesting envelopes get shredded or recycled here! there are some really wonderful security patterns being used. I've been wanting to make a book like this for quite a while, but you beat me to it, and I love them! Great job. Hooray for recycling! Dang, you make cool stuff. And both of those mail art books got snapped up right away. Not that I was going to buy one...okay I WAS I WAS I WAS! I collage, so know about the paper piling up. http://www.collage.gingermayerson.com in case anyone wants to check. 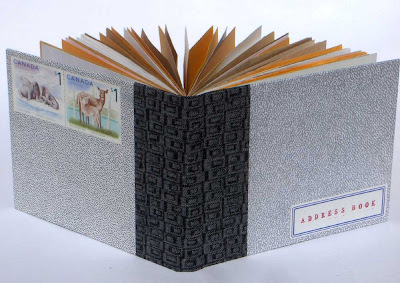 I made collage books out of two of your small recycled books. They were the perfect size for the smaller cases.